So some friends did something really, really, REALLY nice for us. Since we cannot ever repay them for their gesture, we invited them over for a homemade Mexican dinner. Homemade chips and homemade salsa, chicken-avocado enchiladas, chile rellanos, pinto beans. I needed a dessert that was both special and would go well with Mexican. 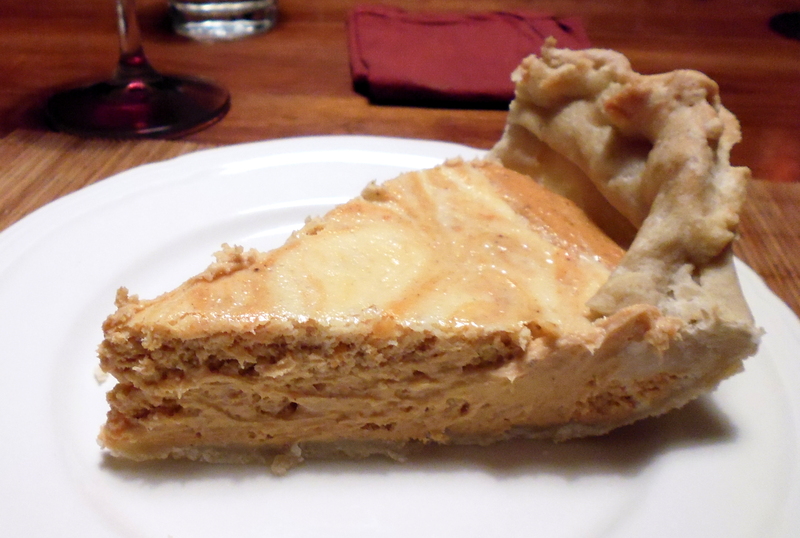 I thought perhaps a sweet potato pie would be good, but then thought about a pineapple cheesecake I once had after a very hot Mexican meal – the perfect antidote. That lead to thoughts of a sweet potato cheesecake. Eventually I found this recipe. I adapted this a bit. 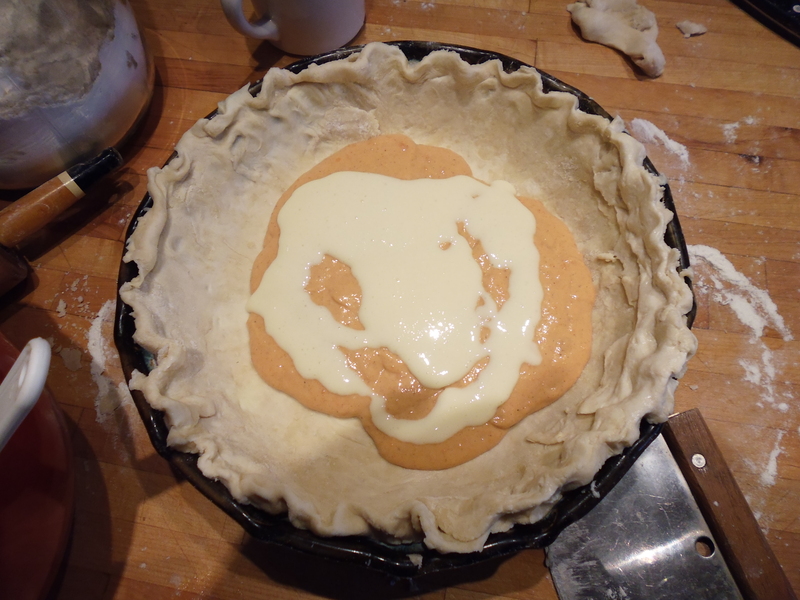 I didn’t want to buy a box of gingersnaps for the crust, and minced nuts get stuck in my husband’s braces, so I went with a regular pie crust. I don’t like the title “Marbled” – it doesn’t sound right when applied to a dessert. Swirl sounded better. 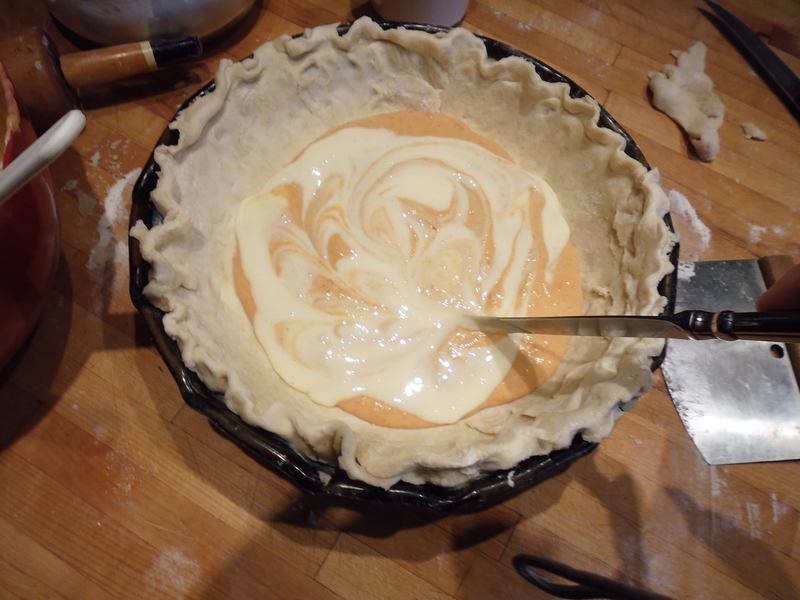 What I used was technically a yam, but there’s something awkward about “Yam Swirl Pie.” It sounds like a bar band. You don’t have to cook a sweet potato – you could use a 1-pound can (drained), or a 1-pound can of pumpkin. Or use leftover butternut squash, acorn squash, etc. And I used low-fat cream cheese. This would make a good Thanksgiving or Christmas dessert. Cook the sweet potato (or suggestions as above). I washed the potato, stabbed it all over with a knife, then microwaved it until cooked (about 7 minutes). When it cools enough to handle, peel and mash it thoroughly. 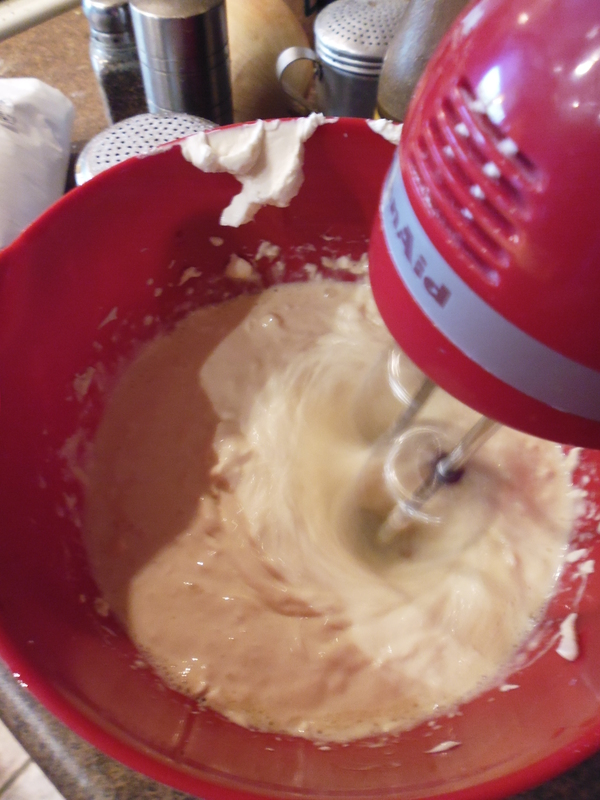 Combine cream cheese, eggs, sugar, and vanilla, and beat with electric mixer until completely smooth. If it seems grainy, beat until the sugar is dissolved (this can be a problem if you use organic sugar, which doesn’t seem to dissolve as easily as plain white granulated sugar). 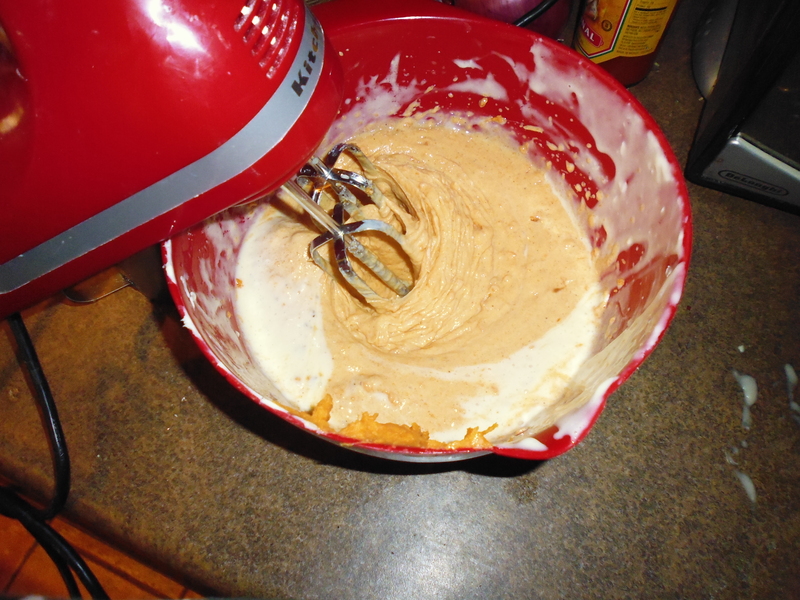 Now remove about 1 cup of the cream cheese mixture and set it aside. 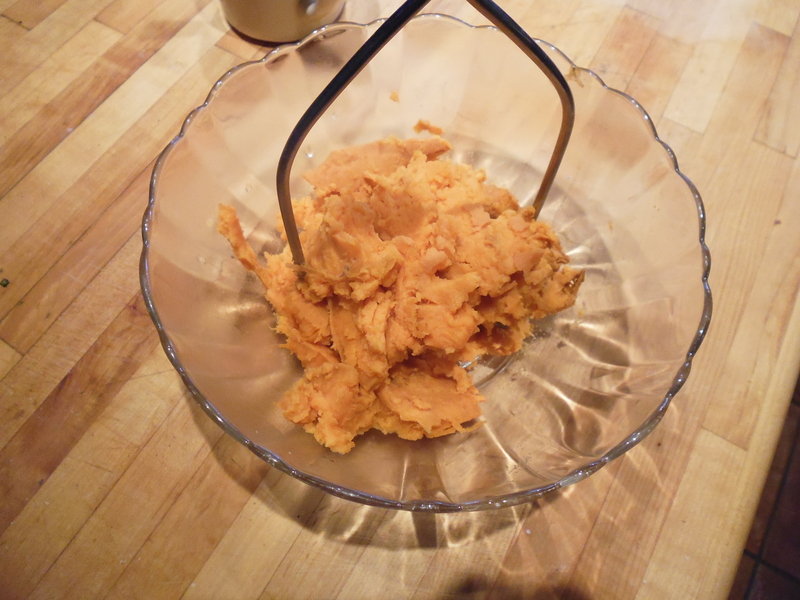 Mix the mashed sweet potato into the remaining cream cheese mixture along with the spices. Again, beat until lump-free and smooth. 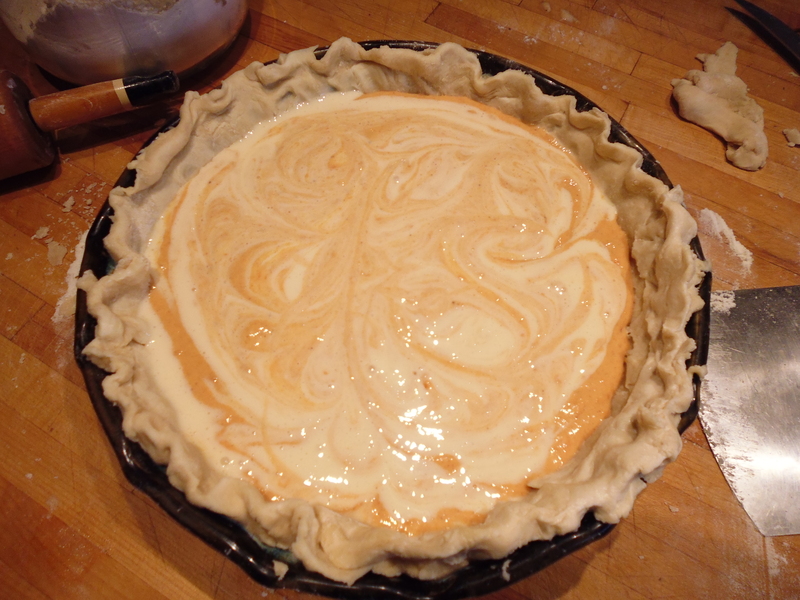 Now, pour about half of the reserved cream cheese mixture and half of the sweet potato mixture into the pie crust. Repeat the layers and again swirl with a knife. Bake at 350 until filling is still slightly jiggly but mostly set, about 30 to 45 minutes, and remove to a rack to cool. If you won’t be serving within a couple of hours, put the cooled pie in the refrigerator. 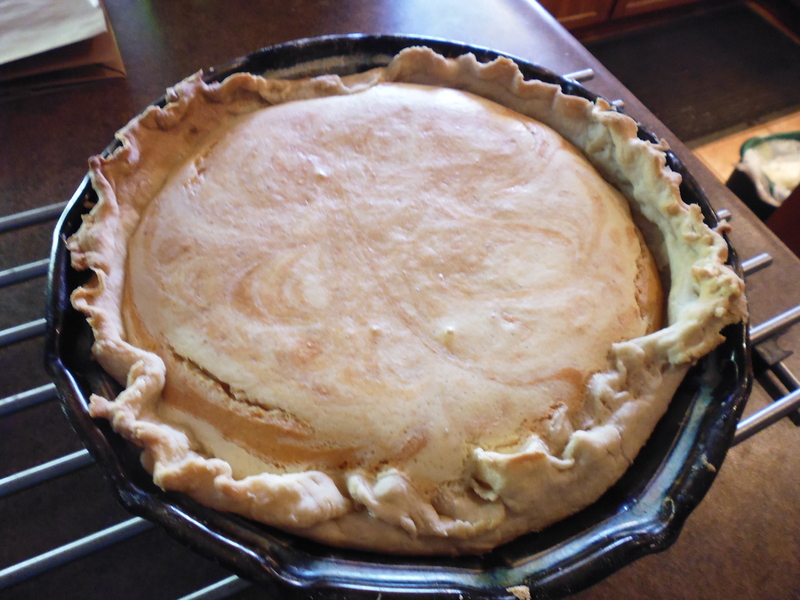 As you can see the edges of the pie crust completely flopped over in a couple of places. If anyone criticizes you, tell them that’s how you know the pie is homemade and not mass-produced. I think it’s important here to not attempt to swirl the two components together too much. Leave definite areas for each filling type. Sweeten with pure maple syrup instead of sugar. Add sufficient spice to the sweet potato filling to really pump up the flavor. Or consider substituting almond extract for the vanilla, or use some of both. You could add a good hit of rum or brandy (or other compatible booze) to one of the fillings. And some sweetened whipped cream would not be amiss here to top it. Posted in recipe and tagged dessert, pie, sweet potatoes, vegetarian. Bookmark the permalink.